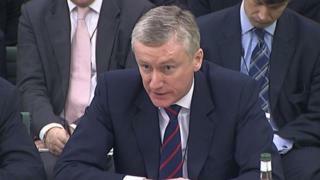 The grand office built for Fred Goodwin when he was chief executive of the Royal Bank of Scotland is being turned over to 80 entrepreneurs. RBS announced that the "executive wing" at its Gogarburn headquarters in west Edinburgh was to be occupied by those setting up in business. The centre will house staff from business organisations such as Entrepreneurial Spark. It will be home to its "business accelerator hub". The Gogarburn corporate campus, to the west side of the capital, was intended to send a signal as a prestige HQ befitting a leading global bank, with the highest specification materials used for the chief executive's office. But when the bank had to be rescued by a government bailout in 2008 and Mr Goodwin was forced to quit, it became a symbol of the Royal Bank's over-ambition and the chief executive's extravagance. The new Entrepreneurial Spark hub will help early-stage start-ups and high growth, high impact businesses. Up to 80 entrepreneurs are expected to be based at the hub, where they will get access to specially-trained RBS staff and business mentors. RBS chief executive Ross McEwan said: "It is not just start-up businesses that need to be innovative and forward-thinking to thrive and grow, RBS needs to be as well. "That is why we are opening up our headquarters so that we can support Scottish businesses of tomorrow, not just with infrastructure, but through the chance to collaborate with experts and other like-minded business owners. "This marks a step change in how we can work with partners to support our local economy."